Researchers at Aalto University (Finland) and Amherst College have observed a point-like monopole in a quantum field itself for the first time. This discovery connects to important characteristics of the elusive monopole magnet. The results were just published in Science magazine. The researchers performed an experiment in which they manipulated a gas of rubidium atoms prepared in a nonmagnetic state near absolute zero temperature. Under these extreme conditions they were able to create a monopole in the quantum-mechanical field that describes the gas. 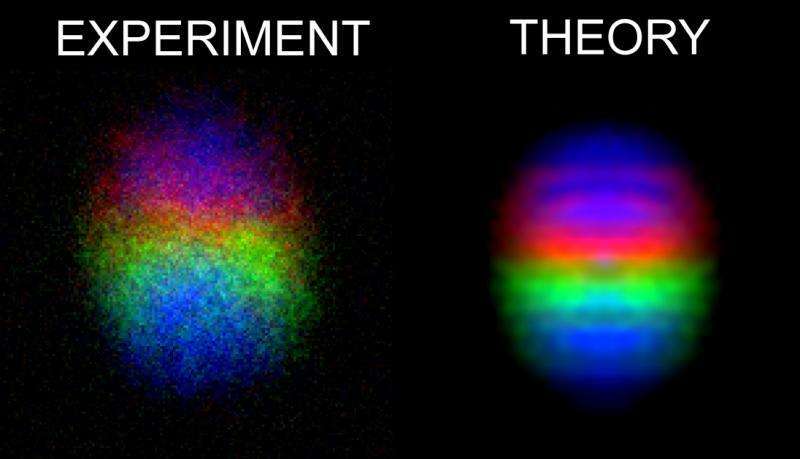 'In this nonmagnetic state, a structure was created in the field describing the gas, resembling the magnetic monopole particle as described in grand unified theories of particle physics. Previously, we have used the gas to detect a monopole within a so-called synthetic magnetic field, but there has been no monopole in the quantum field describing the gas itself. Now we have finally witnessed the quantum-mechanical monopole! ', enthuses Dr. Mikko Möttönen, Aalto University. 'In the nonmagnetic state of the gas, no quantum whirlpools or monopoles are created in the synthetic magnetic field. However, quantum-mechanical magnetic order prevails in the sample, and we were able to manipulate this with adjustments to an externally applied magnetic field', Möttönen continues. 'The control of those magnetic fields must be stable to a small fraction of the size of the Earth's magnetic field', adds Prof. David Hall, Amherst College. 'The main experimental challenge we faced is to prepare the ultracold gas under highly sensitive conditions, in which field fluctuations due to the motion of metal objects or power line variations can make observation of the monopoles difficult. ', Hall continues. The result is a remarkable step forward in quantum research. It is important to understand the structure of monopoles and other topological entities, in part because they appear in the models describing the early universe and affect the properties of many different materials, such as metals. 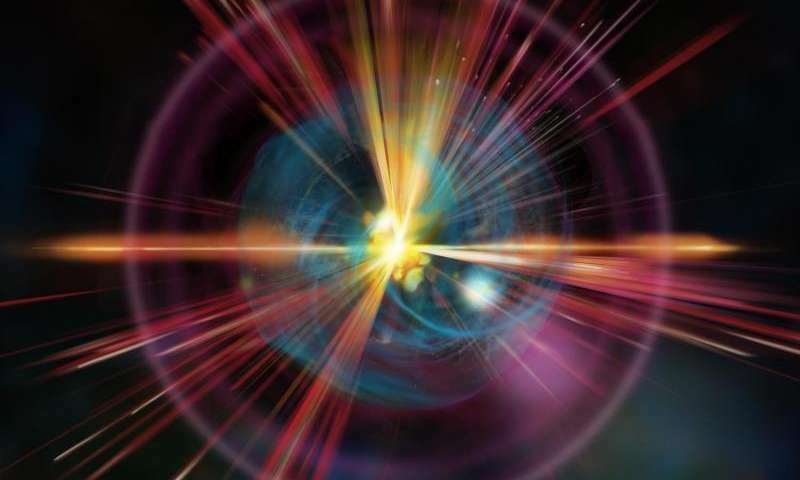 The discovery of a magnetic monopole particle is still in the future. This new result establishes that the structure of a quantum mechanical monopole does appear in nature, and therefore it further supports the possibility that magnetic monopoles exist. Are complaining that you need a college education to be a quantum physicist? Steve, believe it or not, some of our cranks here are highly educated. A degree is no guarantor of sanity. 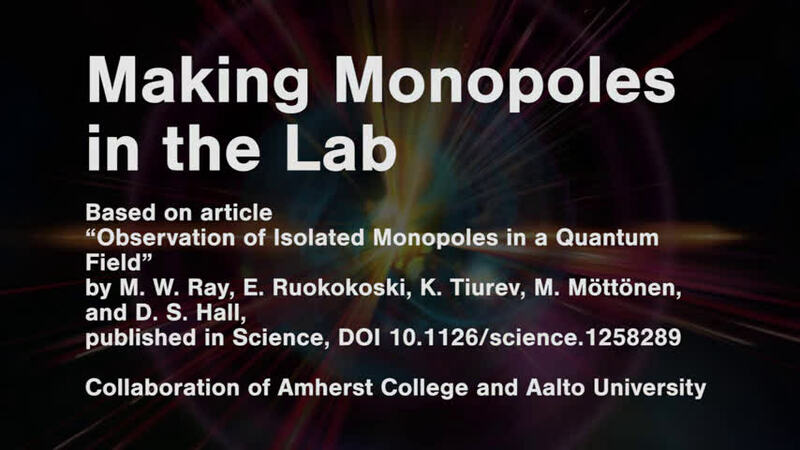 Incidentally: the video definitely states they observed quantum monopoles in Bose-Einstein condensates. The Phys.org article, presumably summarizing the Science study, suggests that the discovery of quantum monopoles has not yet occurred. I'm going to go with the latter interpretation. What they saw is a quantum field that resembles a simulation based on theory, which looks as though monopoles could exist in the field. It's sure not a slam dunk showing monopoles *do* exist. @docile- ". . . that these black holes also represent a giant magnetic monopoles." That's an interesting notion and would explain a few things, certainly. Looks like I have some research to do this weekend- thanks! @docile: So you are saying that quasi-particle monopoles do not exist (are "violating the entropy laws"). But they were observed a year or so back. And this is another variant. As Urqelt notes, it is probably a more localized field variant (which of course can be quasi-particle too), but one would need to read the paper. I would use QM Mode not pole, juz say/n. Appears like? Does defying known physics appear as a correct interpretation of what it appears! First to state I am not by any means a know it all when it comes to physics, I took the course in college. I have experimented and cannot state whether or not what was considered 'visualized' was what is considered monopoles but the point remains. Could these monopoles be seen in ferrofluid? I questioned this during an experiment which more or less parted the fluid entirely and there were no magnetic "poles", the fluid was separated into two opposing fields perpendicular to each other. The thought of parting the seas was the only thing that I could say it resembeled although really looking at it you could see the fluid motion which resembled a ball of fluid at super high speed. I am not sure if this is considered a monopole or not but it did seem the fluid did part and there were fields parallel and perpendicular to each other. Thoughts? ... the fluid was separated into two opposing fields perpendicular to each other. The thought of parting the seas was the only thing that I could say it resembeled... Thoughts? Not quite sure you are describing "perpendicular" fields. More like repelling. This observation isn't http://www.scient...monopole result from the same mechanism and that these black holes also represent a giant magnetic monopoles. Only because our understanding of the "laws of entropy" are incomplete. Whydening Gyre - the ferro fluid is in a jar and it split at a 45 degree angle. 90 degrees total i suppose. one half of the fluid was rotating and was on the bottom of the jar. the other half was a right angle 90 degrees on the side of the jar and it was visibly split in half parting the seas at 45 degrees. the fluid was definitely spinning, it was hard to tell the direction as the fluid was very uniform. I hope this clears up my initial question of whether or not this fluid acting in this matter is the same as monopoles? the magnetic flux and outward throw are likely why the fluid split but i was under the impresion that this nanofluid was not able to be considered two fields. You cant get any similar reaction sticking magnets to the bottom and side of the jar which was why I posted to see if this is related at all. I will continue my research and experiments whether or not that i can stamp a formula to qhat is actualy going on. Whydening Gyre - the ferro fluid is in a jar and it split at a 45 degree angle. 90 degrees total i suppose. one half of the fluid was rotating and was on the bottom of the jar. the other half was a right angle 90 degrees on the side of the jar and it was visibly split in half parting the seas at 45 degrees. Still having a tuff time visualizing (must have missed that class). How did you get this reaction? Apply a charge? Any ferrous fluid will already be dipolar by nature. As will an electrical charge. But, it sounds by your description, you must have seen the ferrous material attempting to align along whatever dipolar field lines were being generated, but contained by the jar.